A family environment where you will feel immediately at ease. A delicious corner finished with old wooden panels. 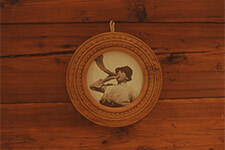 Several paintings by local artists embellish the walls and a late seventeenth century wardrobe makes it very special. Breakfast is served from a tasty buffet. 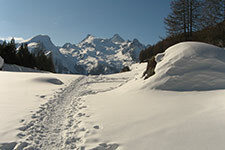 At Cogne you will find prepared walkways in the snow or routes to undertake with snow racquets. You can explore the Gran Paradiso Nature Reserve and try to make photo shots of the animals coming down to valley in their winter coats. 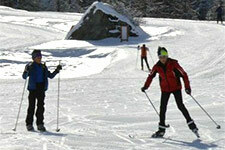 Long pistes for all levels of Nordic skiing await you. Alpine ski pistes and immense areas for ski-tours. The frozen waterfalls of Lillaz and in Valnontey for the adventurous climbers. And when your legs call out for a rest, relax on out outdoor area and go for a sun tan.